There’s so much about Riviera Nayarit to discover. 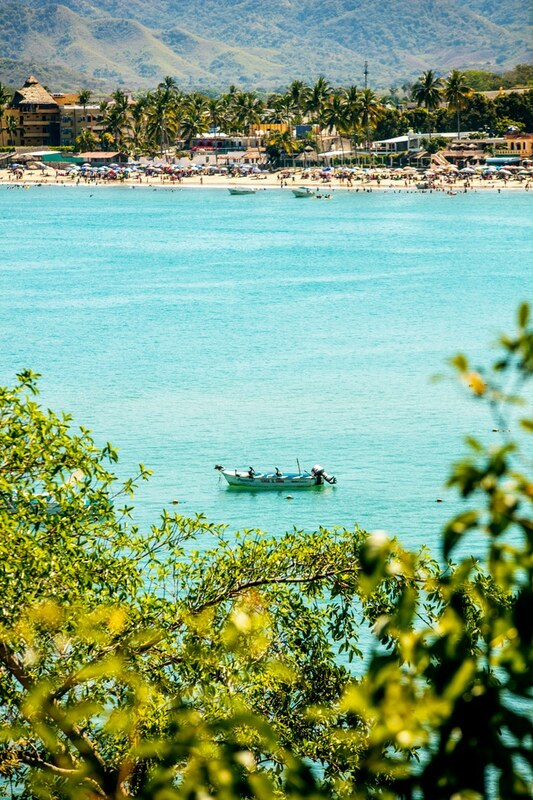 Nestled between the Pacific Ocean and the Western Sierra Madre Mountains this stunning treasure awaits you — Riviera Nayarit, Mexico’s fabulous new vacation paradise! Nayarit is a tropical wonder whose Pacific coastline stretches for almost 200 miles. Nayarit’s southern border unfolds just 10 minutes north of the Puerto Vallarta International Airport. Its northern border unfolds just 40 minutes west of the Tepic International Airport. Riviera Nayarit Mexico provides a backdrop of intense skies, emerald mountains, abundant vegetation and endless beautiful golden beaches for an unforgettable Mexico vacation experience. What most vacationers love about Riviera Nayarit is that this part of Mexico is marked by a predominately sub-humid climate and an annual average temperature of 25°C (77°F). Ninety percent of the year is met with bright rays of sunshine. This creates the ideal environment for the growth of exuberant flora that take on intense colorful hues and beautifully paint the land. On every Nayarit beach, in every little Pacific Coast town, Mexico’s lush vegetation, the extraordinary animal species, and the beauty of nature will leave you totally awed. Nayarit Mexico’s Pacific coastline winds north through the municipalities of Banderas Bay, Compostela, San Blas, Santiago and Tecuala Mexico. 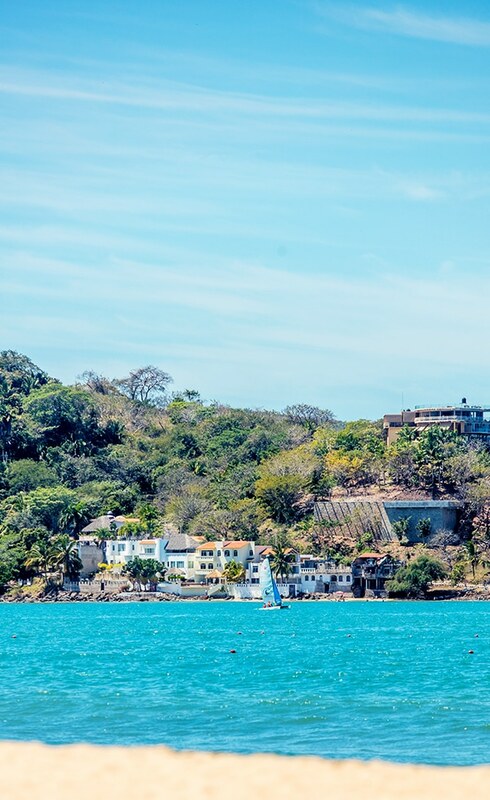 Banderas Bay, one of the largest and most beautiful tropical bays in the world, plays host to a spectacular natural phenomenon year after year. Every winter, humpback whales arrive at Banderas Bay to give birth. Their magnificent breaches, jumps, and water spouts, along with glimpses of their newborns, is an attraction that vacationers never forget. The authentic Mexican flavor of this colorful Nayarit destination blends with the luxurious comforts of the region’s beach hotels and resorts, leaving a lasting impression for vacationers. As you travel about Riviera Nayarit, be sure to explore the many small picturesque seaside towns and pueblos that are brimming with history and cultural experiences. Be sure to visit the Huichol Indians whose beaded arts and crafts provide Mexico visitors with treasures that often accompany them home. Swim with dolphins and sea lions, enjoy Mexico Golf Vacations on world-class golf courses, catch-a-wave on a surfboard, or land a tuna, sailfish, or trophy marlin during your Mexico Fishing Vacation. Dive into warm blue Pacific Coast waters that are home to numerous colonies of coral reefs, fish, and marine mammals of the Mexican Pacific. Soar through jungle treetops on canopy zip lines, conquer the mountains on ATVs and watch a breathtaking orange sun meet the sea during a sunset sail, all before enjoying a gourmet meal under a starlit sky. Bird lovers have discovered something about Riviera Nayarit state that is well worth sharing. In the northern part of the state the salt water and fresh water become one as they feed into numerous estuaries, lagoons, and the National Marshes…a virtual bird lovers’ paradise. The National Marshes and mangroves serve as a sanctuary for Mexico’s migratory birds, but also crocodiles, water walking lizards, and other wildlife species. Farther inland is the Sierra de Vallejo State Biosphere Reserve, a tropical mountain range home to jaguars, wild boars, and parrots, resplendent with elephant ear, amate, and mahogany trees. The San Juan State Biosphere Reserve is impressive with its fragrant forests lining the base of the San Juan and Sangagüey volcano. All of these Pacific coast natural Mexico wonders are just a glimpse of what you will find in the Riviera Nayarit. Come vacation in a tropical paradise full of luxury, fun, and comforts that eagerly await your arrival – Riviera Nayarit will exceed your wildest vacation expectations. There’s something special about Riviera Nayarit; the people, the customs, and the history will enrich your visit since you will have the opportunity to learn about the culture and traditions of the region first hand. Explore Mexican museums and archeological sites and delve into the works of writers, sculptors, and artisans that represent the spirit of these lands. And, to round out your cultural and historic adventure, don’t forget to visit the archeological sites of Altavista, located in the municipality of Compostela, and Los Toriles, in Ixtlán del Río. Riviera Nayarit is a multicultural, multiethnic, and multilingual state, flavored with the lifestyle and traditions of the cultures that provide its depth and identity. Its four tribes of indigenous people, the Huicholes, Coras, Tepehuanos and Mexicaneros, still exist today and visitors can take tours to their communities to learn about some of the ethnic group’s ceremonies, lifestyles, and artistic creations. 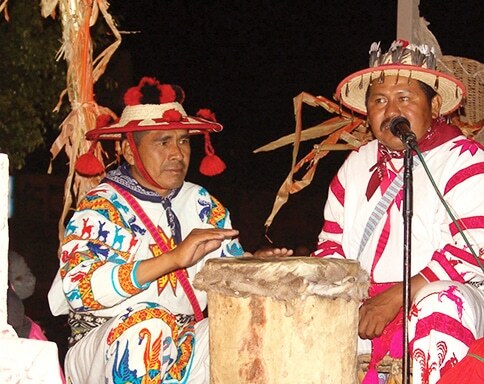 The most popular group for visitors to encounter are the Huicholes who are distinguished by their colorful dress, embroidered manta cloth clothing, and plumed hats. They are also known for their elaborate bracelets, rings and necklaces made of crystal beads that also shape their vision of the universe. 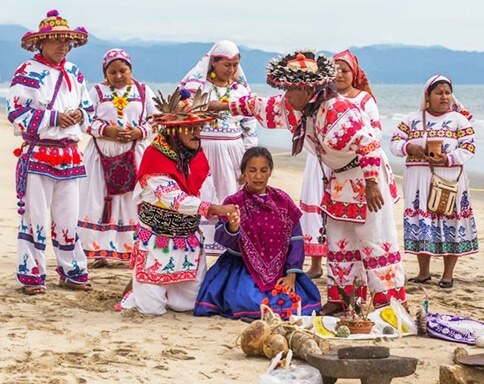 Also known as Wixaricas —Children of the Sun— the Huicholes are truly fascinating people, each one making a moral promise to visit the five sacred places of their faith in their lifetimes, one of which is the Tatei Amara —White Rock—, found in the historic port of San Blas. 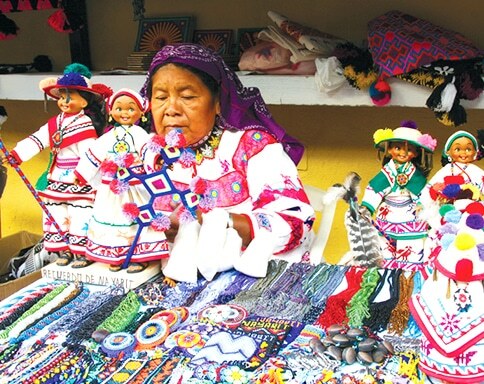 Don’t miss the opportunity to explore and admire their original and colorful handicrafts. For instance, their hummingbirds crafted from string that sail the skies painted with deep yellows and feverish purples; and the felines that take form in brilliant crystal beads. The Huicholes’ art and craftworks make very popular keepsake treasures that many vacationers proudly display once back home. The Coras, renowned for their ceramics, live mainly in the municipality of Nayar, in the western part of the state. Their dialect is related to that of the Huicholes. The Tepehuanos inhabit small areas in the municipality of Huajicori, and among the artistic products created by this ethnic group are yarn knapsacks, hats, clay pots, and equipales (traditional barrel chairs with a woven palm base and leather seat and back). The Mexicaneros live among the other ethnic groups and are often dedicated to weaving reed baskets, bins, and chiquihuites (small containers with lids), as well as creating wood art pieces, ixtle nets made of maguey fibers, and yarn knapsacks. The culture and traditions of the people of the Riviera Nayarit Mexico deliver an authentic flavor and unique component to the very special experience here that will endear you to the destination. CLICK HERE to watch a video about Riviera Nayarit Culture and Traditions. Our Visitors & Convention Bureau representatives here at the Riviera Nayarit Mexico Board of Tourism are here to serve you. 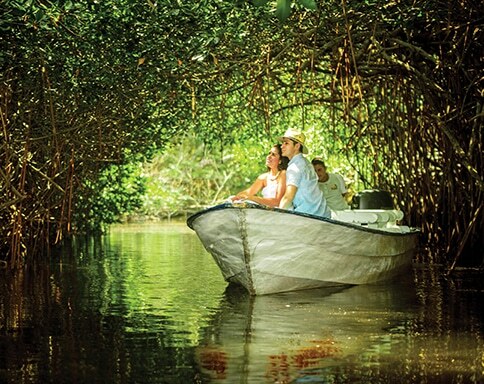 To learn more about Riviera Nayarit – Download the Riviera Nayarit Mexico Brochure. Click here to view more Riviera Nayarit Photos. Watch Youtube videos about Mexico’s Pacific Treasure; Riviera Nayarit Videos.